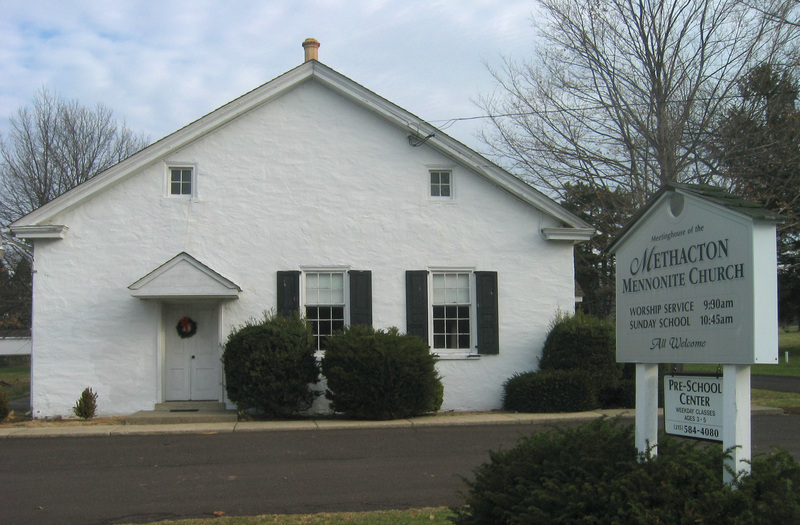 Methacton Mennonite Church has been connecting people to Jesus since 1739. The land on which the meetinghouse is located was deeded to the Dutch Anabaptist Society–Mennonite/Anabaptist families moving north from Germantown up Germantown Pike–for 5 shillings. The first meetinghouse was built prior to 1771 although the exact date is unknown. A second meetinghouse was erected of stone in 1805 and used as a community school and place of worship. The third and present meetinghouse was erected in 1873. As Mennonite families moved further north towards Souderton/ Franconia in the following centuries, Methacton congregation found itself moving to the fringes of the larger Mennonite community. This is its gift and its challenge. Without “ethnic Mennonites” (people of Swiss-German descent who grew up in the Mennonite Church) in the community, this church has always needed to draw people from the local community, from the Worcester/Collegeville area, to continue to exist. We saw this need to turn to our community in the 1940s, when, after dropping to only one member in 1943, a large Summer Bible School program was begun with the help of several families from the Plains congregation. Thus began a new era in the church’s existence. Through this vigorous Summer Bible School outreach into the ‘50s and through the preschool (begun in 1958), community people were drawn into the church and preschool ministry. The preschool continues to the present day. Methacton has never been a large Mennonite church; it has never been a congregation that could continue to exist on its past, or its own strength of numbers. It has to exist because of a mission and God’s purpose for placing us in our specific context. As we look to the future, we’re trying to reorient ourselves to our local community of Worcester, Norristown, and Collegeville. We have a diverse membership representing various ethnic, racial, and religious backgrounds. The common bond is a faith committed to a disciplined life, which is both meaningful and evident in daily living. Our vision statement is “Connecting People to Jesus;” we love connecting, we love people, and we love Jesus.